1583 Entire from the Merchant House of Nicolas + Thomas Channyn at ROUEN addressed to "Sign Bartoloeo Corsini in London" PAID THROUGH TO RYE VIA DIEPPE SHOWING MANUSCRIPT "IL PORTO" (ie paid but only through France and to Rye). 1788 FREE entire to London to a "Member of Parliament" showing a fine 64 RYE first-type mileage and circular-framed FREE/S, L770. 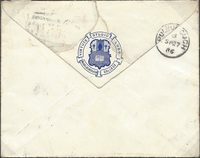 1886 Envelope from Marlborough to Pulborough showing MARLBOROUGH COLLEGE Crest on the reverse. 1833 Interesting content re packing boxes and content entire from St Leonards to a Furniture Repository in London showing a fine boxed HASTINGS/PENNY POST, SX 626. 1905 1d ROSE-RED, SG 43, PLATE 207, tied to envelope addressed to Willesden by a very fine BRIGHTON circular datestamp - A VERY LATE USE OF THE 1d ROSE-RED. 1837 CROSS POST ENTIRE FROM SANDWICH TO RYE, SUSSEX. SENT CROSS POST "X COAST MAIL". 1733 Cover from Winchester to Cowdery redirected to Midhurst and showing two very fine London Bishop marks for '8/NO' and '13/NO'. 1854 1d Pink envelope to Rye showing on the reverse a very fine FLIMWELL (under Hurst-Green) undated circle in Blue. 1848 1d Pink envelope to Burton on Trent showing on the front a superb BARCOMBE (under Lewis) undated circle. SUPERB. 1859 Mourning envelope to London from Eastbourne showing on the reverse a VERY FINE 'RECEIVED OPEN AND RESEALED AT THE W.C. DISTRICT OFFICE' in Red, together with a fine "WESTERN CENTRAL OFFICE" seal. 1837 Entire from Chichester addressed to Plymouth showing a VERY FINE CHICHESTER "TOO LATE" in black, SX 344. SCARCE - RECORDED PERIOD OF USE 1837 ONLY. 1838 Entire from London to Battle, Sussex showing on the front a very fine Missent to/Brighton in black. Rare. 1820 Entire from London to Brighton redirected back to London showing a very fine two-line RETURND. FROM/BRIGHTON in black. Scarce. 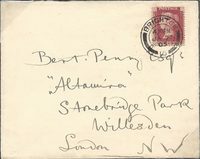 1833 Cover from Valparaiso to London "p Bolivar" showing a fine SHIP LETTER/BRIGHTON, Robs S 5, in black. EX ROBERTSON AND ILLUSTRATED IN HIS BOOK. 1840 24th June Part Cover to Liverpool showing a fine step-framed SHIP LETTER/BRIGHTON, Robs S 5, IN RED - NOT RECORDED BY EITHER ROBERTSON OR TABEART IN RED. 1762 Entire to London showing a very fine RYE, SX 1043. A very early RYE handstamp, recorded from 1761 onwards. 1640 Entire from Friston, Sussex addressed "To his loving friend George Esson at Hastings". A fine, early letter from the reign of Charles I. A few tone spots. 1833 Entire to Olney, Bucks opening out to display a very fine Boxed 'W' of the BRIGHTON WESTERN OFFICE, SX 243. 1821 Entire to Brighton showing a very fine straight line GARDEN STREET (of Battle), SX 543. Scarce. 1829 Entire from Croydon addressed to Chichester showing a very fine CHICHESTER circular datestamp for "OC 11/1829" in black, SX 319. Scarce. 1820 Entire from Dieppe to London showing on the reverse a very fine BRIGHTON/SHIP LETTER in black, Robs S4. 1901 BRIGHTON PARCEL POST LABEL attached to parcel tag and franked by FIVE 1/- GREEN & CARMINE, SG 214 and a 3d, SG 203, tied by Brighton Rubber handstamps. The tag is addressed to "1st Batt Royal Suss Regt, South African Field Force". RARE. 1836 Entire from 'George Town' , Demerara to London showing a SHIP LETTER/BRIGHTON, Robs S5, MS '1/4' - 8d Ship Letter + 8d Inland. 1822 Entire from Demerara to London "P. Underwood" showing on the reverse a very fine step-framed BRIGHTON/SHIP LETTER, Robs S4. 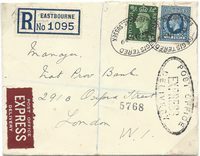 1847 Cover to London "P. Queen" showing a very fine two-line SHIP LETTER/BRIGHTON, Robs S7. Last Year of Recorded Use. 1778 Entire from New York to London "Pr the Hannah Watson" showing a very fine four-line BRIGHT/HELM/STONE/SHIP LRE, Robs S1. Rare. 1821 Entire from Hanover (Estate), Jamaica addressed to Edinburgh and sent "Pr Hanover Cape Adamson" showing a SUPERB HASTINGS/SHIP LETTER, Robs S3. A VERY UNUSUAL ROUTE!!!! Letter concerns a shipment of sugar from Three Mile River. 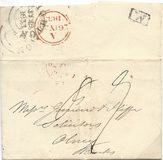 1854 2d Blues, SG 19, Plate 4, N-G, and a strip of Three, M-G/M-I, tied to envelope to Frankfurt by very fine Type 1a BRIGHTON Sideways duplex. Attractive. 1876 FEB 13TH Embossed VALENTINE envelope from Eastbourne to Hyde Park, London, franked by a 1d Rose-Red, SG 43, Plate 134. 1842 Entire to Rye showing unframed "MISSENT/TO/BATTLE". 1777 Entire to London with Straight Line RYE, SX 1043. Superb. 1833 Entire to Highworth, Wiltshire from Brighton showing very fine framed MISSENT to/CHICHESTER, SX 352 - FIRST Year of Use.